In the late 1940s, record sales were great. The Depression and the war had passed and America was entering a new period of comfort and affluence. Just sit back and relax, Truman was going to take care of everything. But there WAS one little problem......the records themselves. Recording technology had changed tremendously since Emile Berliner's first gramophone records in the 1890s. We had gone from unresponsive acoustic recording horns and direct to disc master recording to full electrical recording and tape masters. But very little had changed with the records themselves. 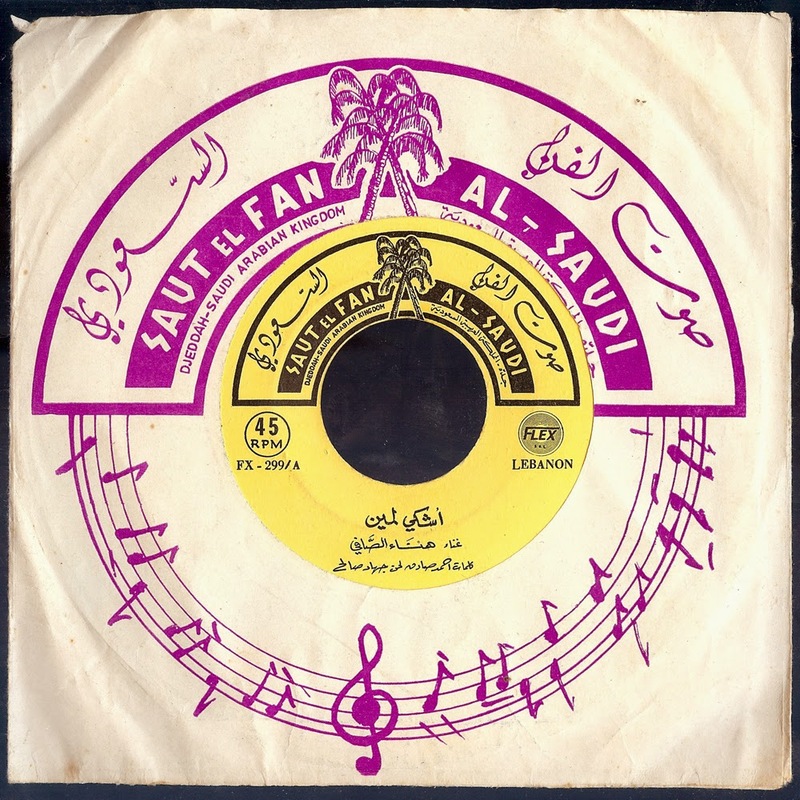 They still rotated at 78 RPM, still made of noisy shellac and extremely fragile. In 1948, Columbia Records unveiled the 33 1/3 RPM long playing record. It played for about 20 minutes per side and made of thick and much quieter vinyl. 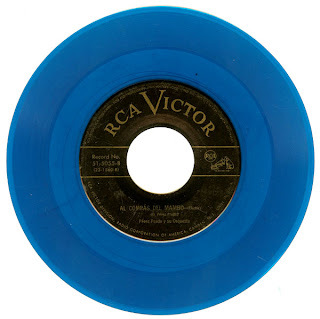 RCA Victor, Columbia's long time rival was also working on a newer and better record at the same time as Columbia. When Columbia came out with the LP record, RCA scrambled on it's own project and in 1949, unveiled the 45 RPM record. 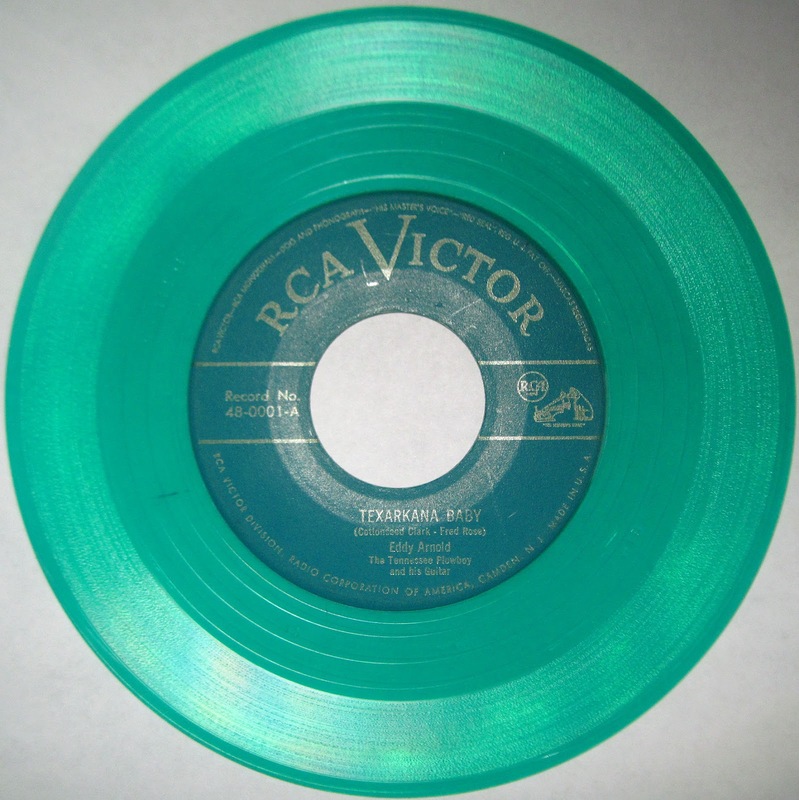 ""Texarkana Baby" Eddy Arnold (1949), the world's first commercially released 45 RPM record. Eventually, RCA soon ended it's coloured vinyl lines due to the price of the coloured vinyl compared to the standard black. 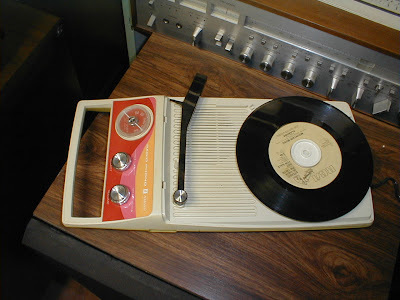 It also employed "The World's Fastest Record Changer"
But the 45 RPM record and RCA 45 players DID have a few problems. 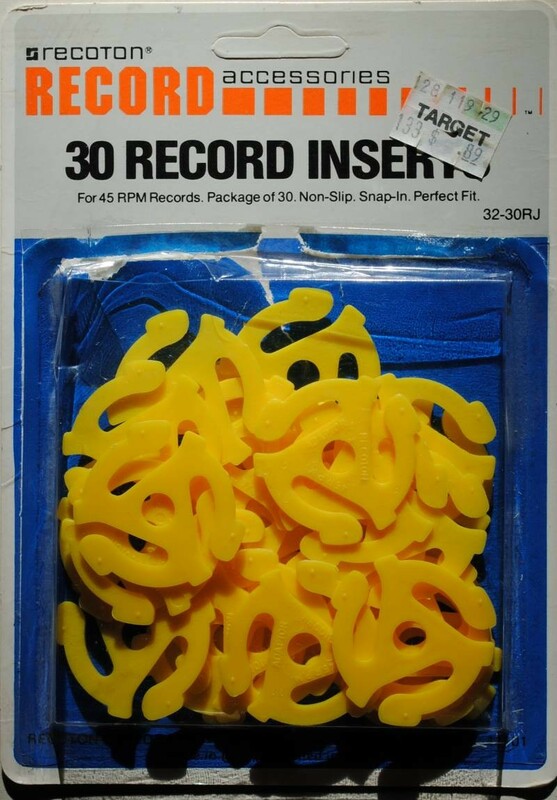 First, the players could only play 45 RPM records. Nothing else. Second, classical music fans still had to put up with the same mid-movement breaks that plagued symphonic fans since the dawn of classical recording. Something the 33 1/3 RPM record rarely had. This era in the turn of the '50s was called "The Battle of The Speeds" Some people preferred the 33 1/3 RPM LP, others the new 45 RPM players and old timers who insisted on the 78 RPM speed. The other major labels mostly aligned with the 33 1/3 RPM LP for albums (Capitol however released albums in all three speeds) and 45 and 78 RPM for singles. The 78 RPM single began disappearing in the early '50s and the 78 RPM speed regulated to children's records through hand-me-down phonographs from their parents. The last American commercially released 78 RPM singles appeared in 1959, however they were still made for children's records and older jukeboxes until 1964. And thus began the era of the 45s. An era that lasted 40 wonderful years. Before the cassette tape, CD and MP3 player, 45s were the perfect portable personal music medium. And the 45s themselves were super cheap too, less than a dollar each. Fun to collect, share and trade with friends. 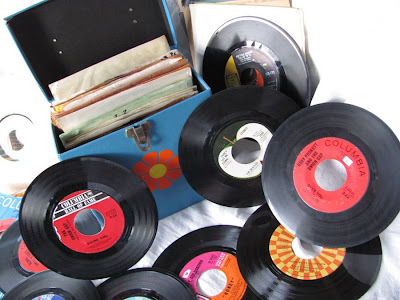 While some kids had baseball cards and comic books, others had 45s. Portable battery operated phonographs were also made for taking your music anywhere. Check this little baby out! And who could forget THESE? 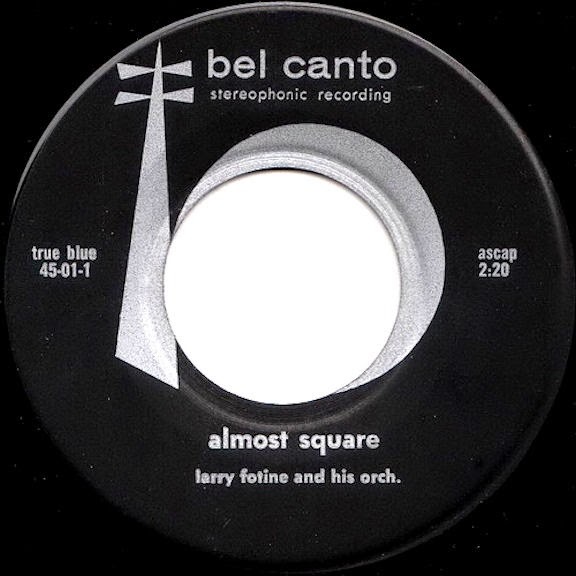 The very first Stereo 45 RPM record was introduced by Bel Canto Records in June of 1958. 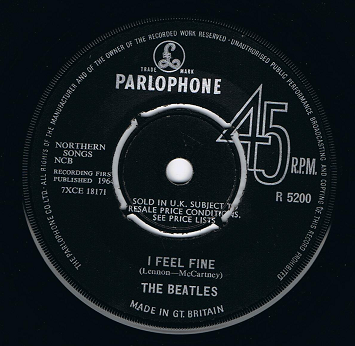 In the UK, Japan and some European countries 45s were pressed with detachable centres. 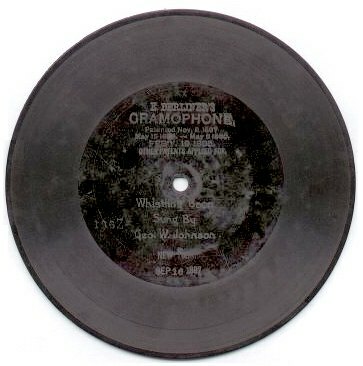 In other European countries, 45s were pressed with a standard 45 spindle hole. The reason there were detachable centres was for compatibility with some foreign record changers (like the early RCA changer, which was extremely popular) and jukeboxes. 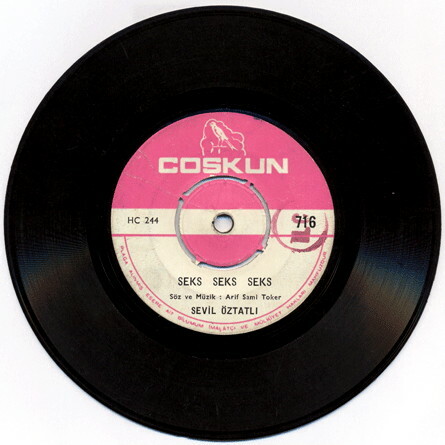 In Australia, most 45s had standard LP spindle holes. 45s also had the B-side. Most were a second, non-single track from the parent album. But sometimes, it would be a live track, an instrumental version of the A-Side song, an outtake from the parent album session. Or sometimes, a completely original song. 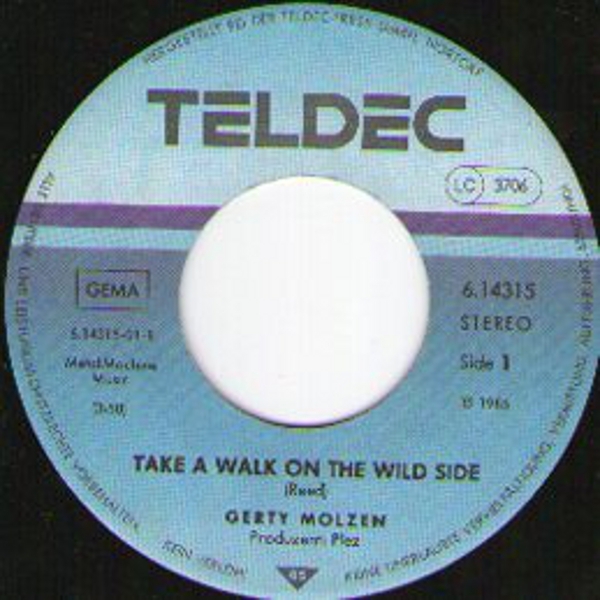 Most of the B-sides of Elton John's 45s had songs recorded just for them, as Elton John felt it gave his fans better value for their money. And they did. Most of them are collector's items and many were never released to CD. There's also been the question of how long can one side of a 45 play. Most 45s run from 2-5 minutes. John Lennon once asked this to George Martin in 1968 and George Martin, after some experimenting, found the answer - 7 minutes, 11 seconds. And thus the playing time of "Hey Jude". I'm sure there could have been longer. But I haven't seen any. 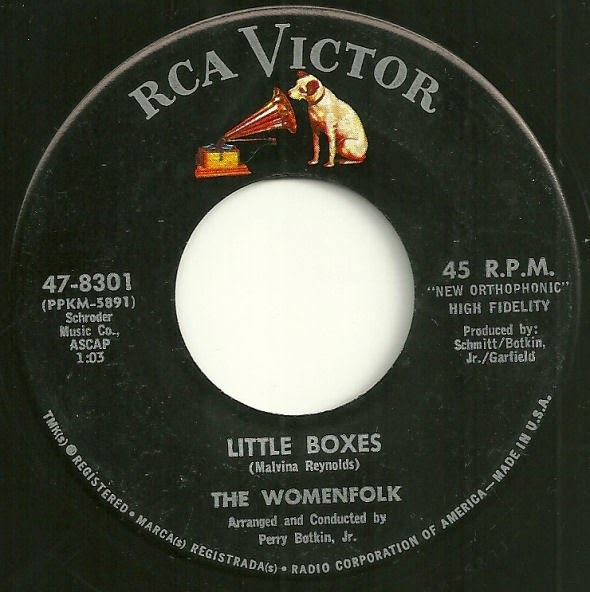 "Little Boxes" The Womenfolk (1964) at 1:03 actually charted in the Billboard Hot 100! But that's the fun of record collecting. Just when you think you've seen and heard it all.....Surprise! 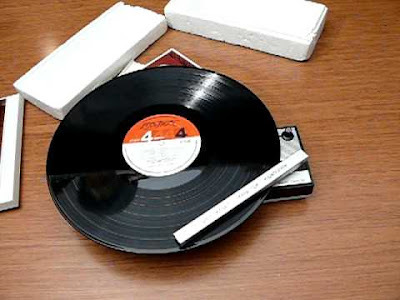 By the beginning of the '80s, sales of 45s were beginning to gradually slip as sales of cassettes and blank tape began ushering the "mixtape" era. CBS noticed this and test marketed the one sided single. In 1987, A&M released the first cassette single and other record companies quickly followed suit. 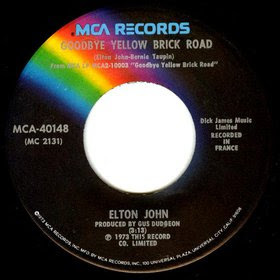 By 1990 however, record companies began discontinuing the 45, except for jukebox releases and collector's items. However with the vinyl resurrection of the last few years, many companies are back to pressing vinyl. But there's something about the 45 that an MP3 simply can't mimic. It's REAL. Just the right size. Something you can hold. And no matter what next big thing comes along, they'll NEVER go out of style. I actually like that Sonny song! lol But probably because it was fun to mime to as Sonny. I really enjoyed this article. I would like to share another "short" playing 45; "The Shortest Song in the World" by Kenny Price clocks in at 0:18, the B Side to "Biloxi," RCA #47-9869. 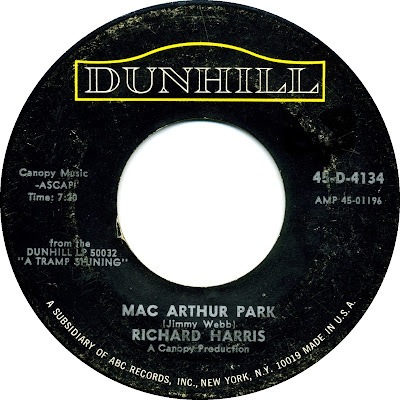 I had always wondered which was the first release (I have both "Texarkana Baby" and Arthur Crudup's "That's Allright / Crudup's After Hours (RCA 50-0000). I still love collecting 45's, and miss shopping at the local record outlets. Thanks again for the great story! singles in International; 15 albums and 1 single in Children's; 5 singles in Race." Thanks Michael. Sorry for getting to you so late. I just found out the bizarre reason I haven't been able to reply on my own blog - I had my comments set to "embedded". 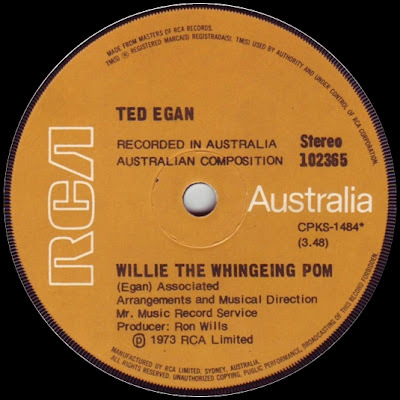 There is another long running single. The Dells - Stay in My Corner. It runs over 6 minutes. I would have to look it up in my collection for the exact time. Well done. Can you answer why RCA made the 45 hole size in the first place? Why not thhe same size hole as a 33? I believe it was for jukeboxes, as a wider spindle hole made it easier for most jukebox selection mechanisms to handle the records. Nah. It wasn't as if RCA was manufacturing jukeboxes - what did they care about jukebox mechanisms? 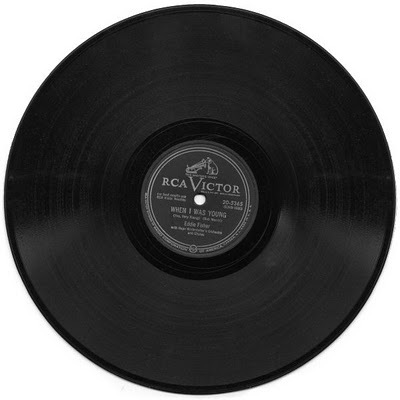 It is true that RCA was looking at developments to overcome what RCA perceived as the shortcomings of 78 rpm records, on a parallel path while 33.3 rpm was being developed. The 33.3 crowd looked more at adapting existing record changer design to play 33.3 records - same center hole size, same 10" and 12" diameters, same changer mechanisms (once it was decided that 33.3 records needed changer operation) - but RCA wanted to throw out the existing changer concepts. At the time the development of the 45 rpm record started, 78 rpm changers largely operated by pushing on the outer edge of a record to drop it down a stepped spindle, or by sticking slicing plates between the outer edges of the records to separate the lowest record from the stack and drop it - and breaking a lot of them in the process. 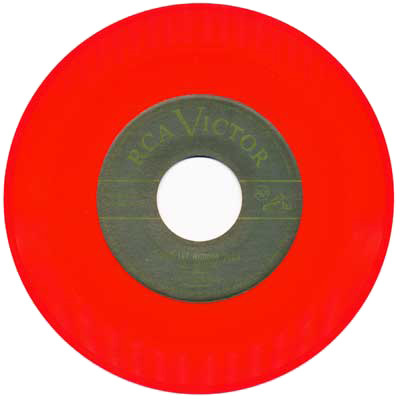 RCA's reasoning and need for the large 45 rpm hole was to move all of that changing process from the outer edge of a record to the inner hole. After much tweaking (and probably some twerking) the RCA engineers determined that they needed a 1.5" diameter spindle to accommodate all the innards of the changer mechanism within the spindle and to do it cheaply. RCA's desire to reinvent the changer mechanism in this way was the reason for the size of the hole. 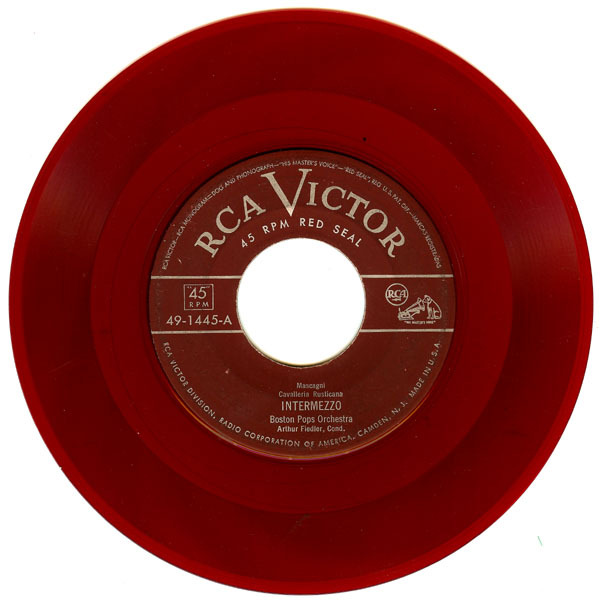 There is a lot more to this entire story that breaks down between what was good science or what was good marketing as to why the RCA 45 rpm came into existence, but moving the changer mechanism from the outside to the inside edge of a record was RCA's explanation for the 1.5" diameter hole. Jukeboxes were an entirely different animal that had changers that in no way resembled home use mechanisms. I can't see RCA feeling the love for jukeboxes ever factoring in to the design. (Nor can I find any mention of it in RCA documents.) All the big money was in the home consumer market. THANK YOU FOR THE INFORMATION, I ENJOYED THE READING, AND ALL THE PICS AND VIDS, I JUST WOULD LIKE TO KNOW WHEN THE FIRST STEREO RECORD WAS RELEASED BY WHOM AND THE DATE, TY SO MUCH FOR ALL THE ABOVE INFO. The B-side of Paul McCartney's "Coming Up" 45 comes in at about 8 minutes, because there are two songs. I remember that. Was that "Lunch Box/Odd Sox"? Yes, it was, but only for the single you bought separately. If you bought the McCartney II album early enough, you got the single which was a one-sided 45 along with your album. Now those songs from the b-side are part of the Venus and Mars releases since that is when they were recorded. The Beatles loved their b-sides, turning many into A-side hits. But they also loved them when forming as a band. They always turned them over to discover tracks that other bands in their area were not covering live in their sets. Once that caught on, they started writing and performing their own compositions which is what made them start writing in the first place, to avoid duplicate sets with other bands who opened for them. But 45 B-sides were their first way to combat this disaster of duplicate stage sets when playing live. The Beatles have one B-side that was never on an album until they released Rarities in 1980. They wanted fans to have something special you could only get via the 45. Larry, you surely know what it is, but for others it's called, You Know My Name, (Look Up The Number). I used to work at a radio station as vinyl was dying out. The last new 45 I can remember seeing was Love Will Lead You Back by Taylor Dayne. It was stamped January 1989. I have not located a Canadian 45 rpm release for Where Does My Heart Beat Now but I am still looking. As that would have been late 1990, it would be harder to find if it exists at all. 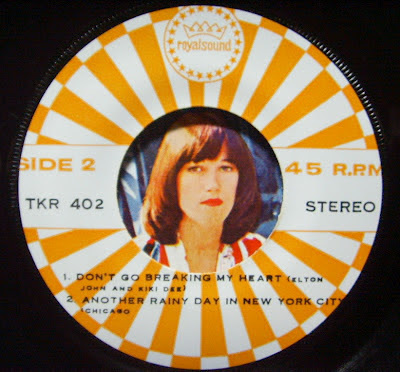 45s that got released prior to March 1990 were generally available in Canada and the US i.e. Sacrifice by Elton John, Free Fallin by Tom Petty, All Around The World by Lisa Stansfield, Get Up! (Before the Night Is Over) by Technotronic -- these are examples. 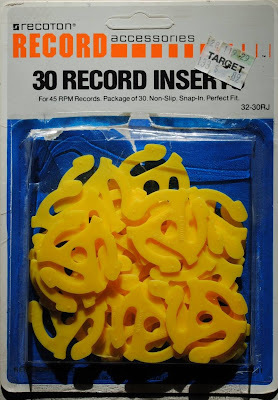 I estimate that by the end of 1990, there were no more 45s available in the stores at all. 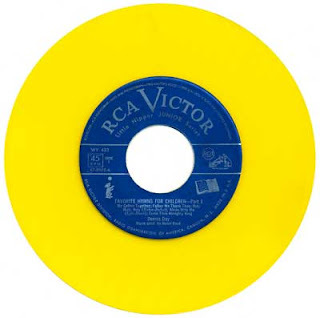 Kenny Price had an RCA 45 "The Shortest Song in the World" which was 19 seconds long. Also Shel Silverstein had a Columbia 45 "26 Second Song" which was 26 seconds long. These would have to be in the running for shortest 45's. I have both of them in my collection. 45s got a new lease on life as 12" "EP" Extended Play singles on the heels of the disco era, to capture the phenom of DJ remixes of dance floor hits. Through the 80s EP 45s were quite common, and I still have a number in my vinyl collection. On another note, going into the 70s 12" vinyl became thinner. I remember when I was 13 (1973) The Carpenters' "Superstar" album on A&M label for how remarkably flexible the disc was. 45s never got that floppy, don't know if this was a cost saver for album makers (1973 oil crisis? ), but vinyl LPs pressed today are often labelled touting the heavy weight of the pressing, expressed in grams. 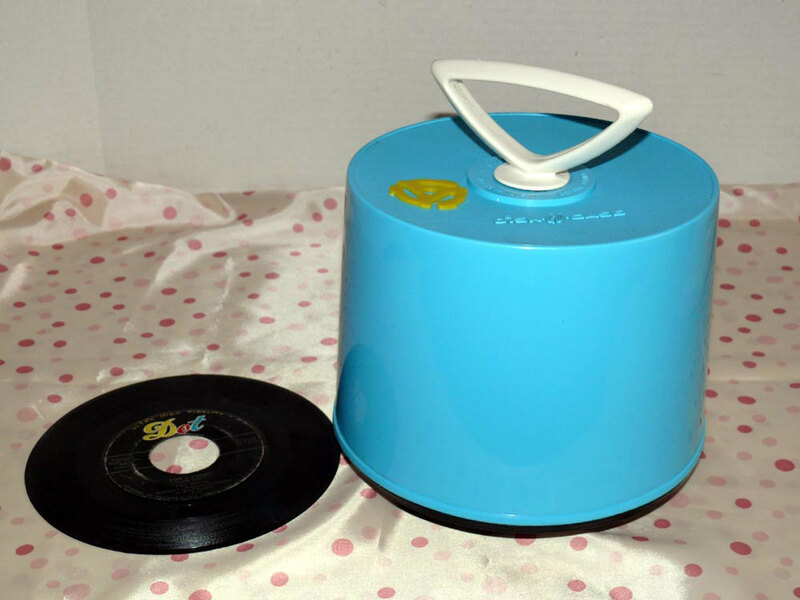 BTW I still have my 45 RPM "Disc-Go" carrying case pictured in blue on your blog, mine is in avocado green and dates to the early 70s. 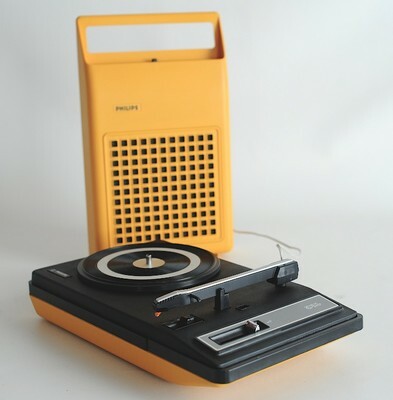 Also remember but don't see it here the "Close 'n Play" record player from the 60s, never had one but was intrigued by the commercial showing how the needle embedded in the lid could play while you carried it around. You can see commercials for the Close 'n Play on YouTube; both the Close 'n Play and the Disc-Go case were awful ideas in terms of abusing the vinyl, and the records in my case are still there but will never see a decent stylus again. I've mentioned the Dynaflex vinyl LP and the Close N' Play elsewhere on this blog. When I wrote this post originally, I thought of including a few paragraphs regarding the 12" single. But not all ran at 45 RPM and in many cases were hard to find outside of major urban areas. Longest one I've ever seen is "Lunar Sea" by Camel, Janus J-262 (B side) 10:27. Shortest one I've seen is "Beside" by The Fastest Group Alive, Valiant V-754 (B side) :35. Excellent article--thanks. Here is a question I want to put out there: What was the last song to hit #1 on the Billboard charts available on 45? Maybe someone can answer this for me. Who came up with the idea of using soft vinyl for 45s? Many of them were brittle plastic that were non-compliant with the needle and were worn quickly creating a great deal of noise. The soft vinyl was pliant and didn't exhibit as much crackle noise in soft passages or cue burns at the start. 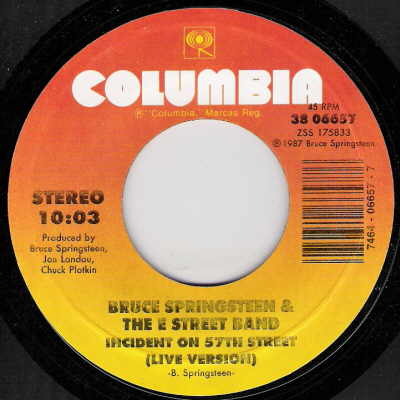 Examples of of hard vinyl include Bruce Springsteen singles and a lot of Columbia product, including Fontana, London, etc. A good soft vinyl that exhibits its superiority is "Hey Jude" by the Beatles. Capitol had a number of soft vinyl releases. My question is: Who originally came up with the idea of using the softer plastic? Was it used first or was the hard plastic first? What's the story? I think you're referring to PVC (vinyl), the "soft vinyl" and polystyrene, the "hard vinyl". Polystyrene is a cheap plastic and wears much quicker and more prone to surface noise whereas PVC is the same material used on LPs. Radio promo singles are often pressed on PVC (except for Bell Records, Bell was also the pioneers of polystyrene pressing, but vinyl came first.) It's really just a manufacturing cost cutter (i.e. bigger profits.) https://www.youtube.com/watch?v=iphutqsYrEw Hope this answers everything. Cheers! Nice article. Mastering engineers were able to cram 10 minutes on a 45 by cutting at a lower volume which creates a smaller groove. The louder the music, the wider the groove will be. Not sure at what playing time length this kicks in, but over a certain time limit you have to make the grooves smaller and less squiggly ("groove cramming"). This makes for quieter music with less dynamic range (and more noise), and less frequency response on the low end. "Wings Greatest", a 60 minute LP (vs. the typical 45 minutes or so), has this problem; and so does the aforementioned B-side of Macca's "Coming Up", as well as the aforementioned K-Tel albums. They are also more prone to scratches (due to the shallower grooves) and skips (due to the grooves being closer to one another). And contrary to what Nick Lowe and Elvis Costello say, it DOES sound bad. Although a 48 minute Elvis Costello LP isn't that bad, timewise. Is it just me, or does the faster speed make a song on a 45 sound better than the same song on a 33.3 LP? If a 45 is manufactured to the original RCA standards, it will be thicker in the label area than out in the groove area. The purpose of this is to prevent the playing surfaces from skidding against one another when stacked on a changer. The first top 40 stereo 45 that I recall was It's a Beautiful Morning by the Rascals on Atlantic. Then Hey Jude by the Beatles on Apple as well as Come and get it by Bad Finger was another early stereo 45. I don't recall any stereo 45's recordings prior to those. Please enlighten me if I'm wrong. Vinyl is still superior to the sound of CD's. Long live the best medium! not 0001 (for example 50-0000 Arthur Crudup, 51-0000 Saul Meisels and 52-0000 Al Goodman. An exception to this is the 49-xxxx classical series which started with 49-0100 Boston Pops. The 47-xxxx series was split between juvenile and popular. The reason RCA started with PeeWee at number 47-0146 is not clear. It's my understanding that first commercial stereophonic records were not available till 1958. 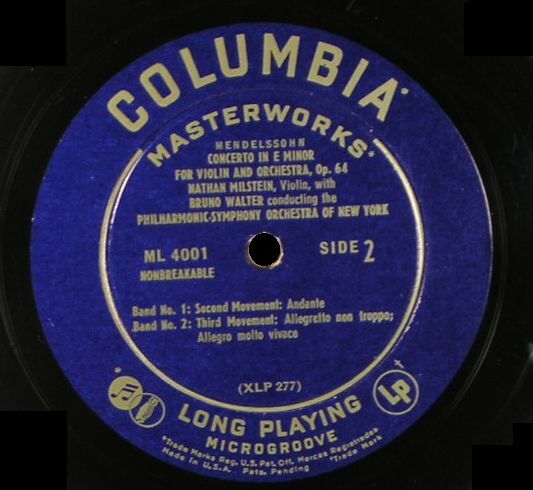 In 1948 the world was just waking up to microgroove monophonic records. Believe me stereo arrived much later on Lp records only. Stereo 45's started to appear in the very late 60's and weren't common till the mid 70,s. How do I know all this? Because I was there. As far as I know, while Bel Canto released the first stereo 45 rpms of any kind, the first stereo 45 by a major artist on a major label was "There Goes My Heart" by Joni James on MGM. 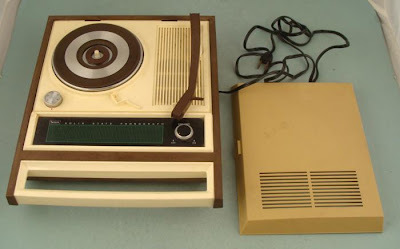 Many other major labels (Columbia, RCA Victor, Liberty, ABC Paramount among them) started making some stereo 45's soon after, but they were a flop; a product nobody wanted. The teenagers who bought 45's played them on those little suitcase portables, which were mono; they didn't want or need stereo. Mom and Dad, who owned that half-ton combo stereo-radio-TV console in the living room, bought stereo records; but LP's, never 45's, and Sinatra and Mathis, never rock 'n roll. The fact that stereo 45's cost about half again as much as mono sealed their fate. I suspect stereo 45's were brought back in the 70's in part due to the need for stereo DJ copies for the increasing number of FM radio stations. 45's continued to be made, maybe on and off and in small quantities, for the jukebox trade. I have in my collection 45's of Maroon 5's "Harder To Breathe" and Shakira's "Wherever, Whenever" among others.